With a focus on “Design and the Future of Advertising,” the 4A’s CreateTech 2016 conference covered a range of topics involving technology, design, and marketing. 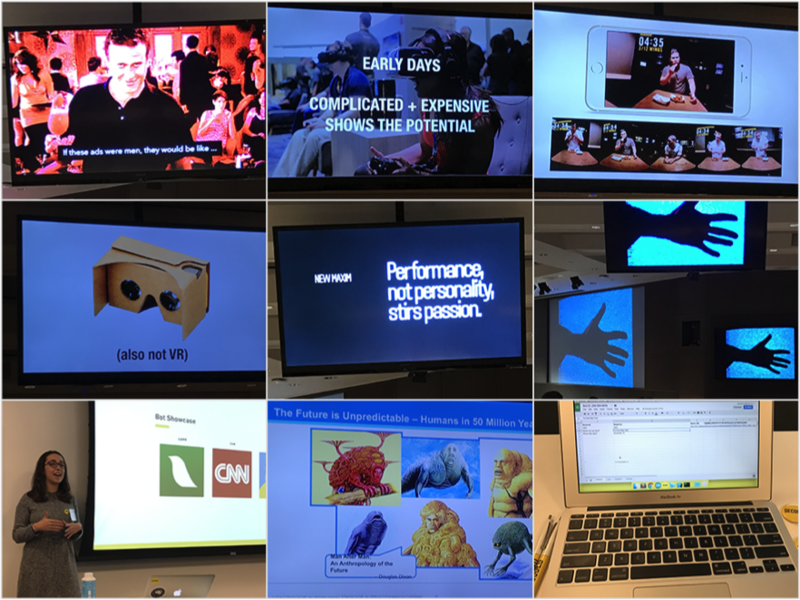 A key theme was Experience – to know and understand your user, to anticipate their wants and needs, and to ensure a unique and positive experience. As consumers, our expectations are high. Information, resources, and options surround us. When brands provide good experiences, it raises the bar. We grow to expect good experiences and are able to eliminate brands that don’t deliver. I attended a number of sessions, including an extremely fun “Build-an-AI-Bot Workshop” (led by Shophie Hebdidge from Decoded), where we talked about the hits and misses from various bots we’ve encountered. We were provided with tools to build our own web-based bot that would text responses defined by a spreadsheet we’d populated. It was interesting to consider the impact of language and personality applied to a bot. Don’t worry that robots will steal your job. Fifteen years ago, we heard that computers would take away our jobs. Did they? No… in fact, they have created more jobs than they’ve taken away. Humans will always need other humans. Robots need humans too. And robots will never be as human as humans. Before you jump into the creation of a mobile app, consider the fact that most people don’t actively seek out new apps to download. And even if they do download your app, it’s quite likely they won’t use it. Most people rely on only 5 or so apps in total. VR, VR, VR is all the buzz these days, but we’re still in the early days of “figuring it out.” It’s exciting but also strange. It’s challenging to get right, but don’t let that stop you from trying. Keep experimenting. Be curious and passionate. Pay attention to what others are doing in the space. The same goes for 360 video, augmented reality, and chat bots. When designing for VR, keep the experience simple, and assume that your audience has zero VR experience. Be conscious of the time your experience takes and the volume of people who will want to try it out. People won’t remember what you said; they’ll remember how they felt. In 360 video, make sure that there are interesting things in all nooks and crannies, because you can prompt people to focus on one thing but you can’t control where they are focusing at all times, and that’s a big part of the fun in it. Before you design for VR, make sure that you’ve tried out a number of devices and experiences yourself. If you don’t know what it’s like, it’s likely you’ll miss the mark. Don’t forget to consider all of the senses in an experience. One sense that’s severely under-considered is touch. Putting a screen in your store with your .com site loaded is not a good idea. Think of other ways to use technology and digital displays to support the in-store experience. Customize experiences locally in a way that’s tailored to your audience at that moment. Different items (content pieces, products, messaging, etc.) can be pushed based on known external factors… What time of day or season is it? Are there any current events to tap into? What type of audience is listening right now? What is most relevant and interesting to them? Consumers have a very low tolerance for poor experiences. They also tend to be pretty harsh. Even if you think that you’re doing a stellar job, it’s quite possible that your customers don’t see it that way. If there was one takeaway that I gleaned from the 4A’s CreateTech Conference, it was this: A good reputation can’t be forced; it must be earned by way of good experiences.